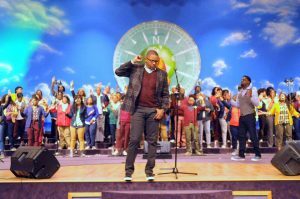 Pastor Hart Ramsey and the NCC Family Choir celebrate their new single, It Is So taking the reigns of radio and landing at #92 on this week ‘s chart. The song comes from the Alabama based church’s sophomore project True Story, which is available online now for pre- order. It Is So is written by Ramsey with assistance from Greg Johnson and Daniel Johnson. Ramsey heads to Miami, Florida the week of August 10th to join Pastor Kim Burrell for the Ephesians 4 Conference and hosts a gathering on prayer at the Northview Christian Church later during the month of August. This entry was posted on Tuesday, August 2nd, 2016 at 9:29 am	and is filed under Artist News and Updates, Billboard Charts, Radio. You can follow any responses to this entry through the RSS 2.0 feed. Both comments and pings are currently closed.